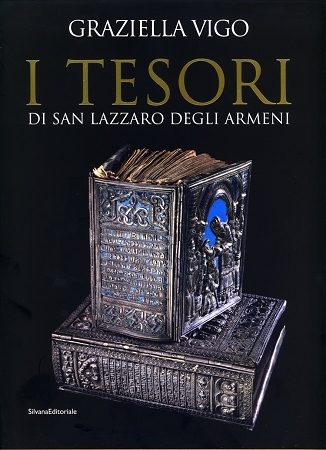 I Tesori di San Lazzaro degli Armeni is a bilingual (Armenian/Italian) coffee table art book comprised of full-page glossy photographs that capture the colorful artistic masterpieces housed in the Armenian Monastery of San Lazzaro (Sourp Ghazar) in Venice. The book is a testament to the extraordinary capability of the Armenian people who, with infinite patience, wrote, copied, illuminated, preserved and rescued these pieces of cultural heritage from oblivion. The Armenian Monastery of the Mekharist Fathers, situated on an island in the Venetian lagoon, was founded in the early eighteenth century by a group of Armenian Catholics seeking refuge from religious persecution in the Ottoman Empire. The monastery was one of the most important centers of Armenian higher learning and literature throughout the eighteenth and nineteenth centuries and played a key role in the Armenian literary and cultural reawakening. Named after the founder of the monastery Abbot Mekhitar, the Mekhitarist Monastery contains some of the most valuable literary and artistic works in the entire Armenian world. This book is a meticulous and passionate photographic record that brings attention to many priceless treasures hidden within the monastery. The photographer has chosen to feature the most beautiful parchments, the richest miniatures and the most precious sacred objects from the monastery's magnificent collection.